Why Do We Love Genres So Much? Why are we so obsessed with cramming games into genres and slapping labels on them? Most game reviews will remark on what genre a game fits in if not declare it outright, and if a game refuses to fit properly they’ll create a new genre just for it –witness the rise of the ridiculously named “third person, cover-based shooter” genre a la Gears of War. When I worked at GameSpy, we developed successful “genre sites” like 3DACtionPlanet.com 2, StrategyPlanet.com, and SportPlanet.com that focused only on games in those genres. There was considerable internal debate over whether this made a lick of sense, but our ad sales guys loved it because it let them sell more targeted ads relative to a huge, monolithic site that covered everything. Part of the reason for this genre love is that classifying things is human nature. It’s a habit instilled and rewarded early in life, as most toddlers love arranging objects according to shape, color, size, or function. And for good reason: assigning objects to sets builds the neural pathways necessary to develop basic skills in logic, counting, and mathematics. So when little Billy puts Doom and Modern Warfare 2 together, you reward him with a delicious frozen treat. But there’s more to it than that: genres are useful for what Amos Tversky and other researchers call “elimination by alternatives” decision making 3 Richard Thaler and Cass Sunstein elaborate on this concept in their excellent book, Nudge. 4 Imagine a simple decision, like say buying a new keyboard for your desktop computer. You’d probably be able to identify all the relevant factors, like your preference for ergonomic layouts, whether or not you want wireless, and price. You can look at the alternatives, take all that into consideration at once, and make your purchase. Fine. Bam. Done. This is called a “compensatory choice strategy” because for any one alternative a single factor (like low price) can compensate for a deficit in another (like lack of wireless support). But think about something way more complex like renting an apartment. You’ve got a multitude of factors at play –distance from work, rent, lease terms, proximity to public transportation, safety of the neighborhood, square footage, and defensibility in the event of a zombie outbreak, just to name a few. AND you’ve got hundreds of potential apartments to choose from. In situations like these, people tend to adopt that “eliminations by alternatives” approach I mentioned earlier. You’ll start picking out factors and setting thresholds for them. So you think “Anyplace with fewer than two bedrooms is out. And it has to be within 30 minutes of work. And it can’t currently be on fire.” And so on. This makes the decision manageable and prevents you from stroking out when you try to combine the weights of so many factors in a compensatory manner and simultaneously compare all the alternatives –of which there could be hundreds. And this usually works. The problem is that options that are outstanding on some important factors can get nuked just because they’re just barely on the wrong side of a cutoff for another. Alas, we are but puny humans. This is a decision-making process that businesses and marketers are eager to hijack, sometimes in ingenious and even helpful ways. Thaler and Sunstein point to paint stores’ use of a color wheel to help you choose colors, as opposed to figuring out the difference between “Eggshell” and “Off White” based on names alone. Or think about going to a bar that boasts “100 beers on tap.” If you look at the menu, they probably don’t have your options listed in alphabetical order because how is the uninitiated supposed to know the difference between “Boddington’s Pub Ale” and “Dirty Dog Hefeweisen?” What any savvy owner of such a bar would do is facilitate elimination by alternative by grouping the beers by more meaningful factors, like taste, body, or color. That way people who dislike, for example, dark beers can automatically discard those options. In other words, group them into genres. This is why I think the habit of sorting genres in video games (and movies and music, for that matter) is so hard to shake. When faced with a huge number of possible games to buy, people use simplifying strategies to make that choice more manageable. One such rule may be “I only like role-playing games,” though I suspect less exclusive rules like “I’ll consider anything that’s not a sports game, a flight sim, or a survival horror game” are more common. It narrows the field and lets you focus on other things. Sure, maybe you’re missing out on some great games through this, but at least you don’t have an aneurysm every time you walk through a Best Buy. Unfortunately I think this is part of the reason that Brutal Legend didn’t do as well at retail as it could: people couldn’t figure out what genre it belonged to. Action? Adventure? Driving? Real-time strategy? It was its own (totally awesome) creation, but because people couldn’t apply a certain decision simplification strategy on it, they missed out. 1. Yeah, I know, I just quoted the Penny Arcade guys just last week, too. I’ll quit for a while. 3. Tversky, A. (1972) “Elimination by Aspects: A Theory of Choice.” Psychological Review, 76, 31-48. 4. Thaler, R. & Sunstein, C. (2008). Nudge: Improving Decisions About Health, Wealth, and Happiness. New York, NY: Penguin Books. 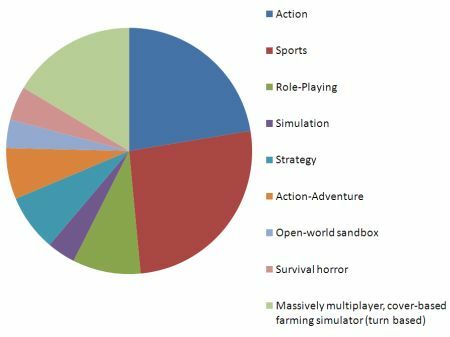 Interesting to note that we tend to classify games into genres based on their mechanics and dynamics – not their thematic or story genre. Mass Effect and Dragon Age are both RPGs, whereas in a bookstore they would be classified as Science Fiction and Fantasy. I think it’s curious in the context of ongoing discussions about ‘how games mean’ and how players identify with games as art and entertainment that even though some some seem resistant to accept the notion of meaning in play (as opposed to in story for example) that our brains – and consequently our classification system and our marketing departments – have already accepted that the meaning of the mechanics of ‘First Person Shooter’ is more relevant to how people experience a game than the meaning of the narrative theme ‘science fiction’. Like those toddlers arranging objects you refer to; we’ve already determined that the meaningful differentiation between games lies in the playing of them not in the surface elements. I don’t know if mechanical genre is really more important than thematic genre. I think they both need to be classified into some marketing niche by either consumers or suits. If thematic genre was less important, then we would see a lot more variation in themes, would we not? Every FPS in the early half of last decade wouldn’t have been WW2 themed, we would have seen more Old West or Fantasy-themes shooters, right? Suits (and designers and consumers) are just as guilty at elimination by alternative by theme: “Old Western-themed games don’t sell.”, even if it uses all the popular FPS mechanics. Perhaps reviewers and marketers classify more by gameplay genre, while customers and suits also care about setting/plot genre. Anyway I was going to say that Brutal Legend may have been hurt by genres not just because it is difficult to classify, but because of the expectations placed on it. The setting was something which hadn’t been done before, and because gameplay genre was difficult to nail down, the marketing revolved around that and the action elements. Even the demo didn’t get into any strategy bits. Most people didn’t realize it wasn’t a straight action game until they were playing it… meaning there were people who bought it HOPING for a pure action game who were disappointed, and made that known. So maybe it would have fared a little better if people knew up front that it was a genre-bender, so they could set their expectations accordingly. Then it would be more likely that the audience it found would be the one with which it would be best received. Yeah, those are interesting thoughts, and ones that apply largely to movies, music, and television as well. There are other queues that I’m sure packaging designers use to categorize games into themes based on their covers. You can usually look at box art and tell if it’s a military game, a Western, a kids’ game, etc. As to why there’s no “Dystopian Future” or “Fantasy” sections at GameStop? …Habit? I’m not sure there’s a good reason. It would make a fascinating experiment to see if shoppers found such a store arrangement useful. Looking at that, it looks like one of those happy movies where the lovable loser is plucked from the stands and leads his hometown team to victory, but it’s not. In fact, I found it ironic that the cover shows a scene from game when, in fact, no game is ever shown in the film. It’s clear that someone in marketing thought that they could market this as a ‘sports film’, when in reality it doesn’t really deal with the actual playing sports at all. However, ‘sports film’ is an easier genre to sell than ‘character study’. I think the lack of a clear genre may have hurt Brutal Legend’s initial marketing, but what killed it was the lack of positive word-of-mouth. And that came from the fact it just wasn’t a very good game–it wasn’t just that the game involved mechanics from different genres, it’s that some of them worked better than others and that made the game uneven. Also, I think this is a case of the subject genre coming into play. Not only was it hard to define gameplay-wise, it was basically unique thematically, and pretty much limited its market to gamers who were also into heavy metal in the 80s. That’s a fairly narrow slice of the venn diagram. On the subject of arranging games by theme, I think the reason it isn’t done that way is that games are all about what you do, rather than where you do it. Sure, some people are sick of elves or space marines or Nazis, but for the most part people care about gameplay more than setting. Even if they really like western movies, they might not play a western FPS because they like more strategy in their games. Man, back in the NES days I remember AGONIZING over rentals because of the misleading art Paul mentioned!! Megaman, as awesome as it was (or is), plays NOTHING like the early art! Ditto several others. Luckily now we get snippets of game play to view online prior to even seeing them in the stores. And as far as genres go, I miss “point and click” adventures. Shadowgate FTW. Maniac Mansion is a close second though not the exact same style! Yup. We’d always heard the term ‘Don’t judge a book by its cover’- we just never applied it to video games. That’s why I can say I’ve played such NES gems as ‘Jeckel and Hyde’ and ‘Friday the 13th’. I loved ‘point and clicks’ back in the day, but unfortunately, I don’t have the patience to play them anymore. Aw, Brutal Legend was great. Flawed, yes, but I loved it anyway. It’s just a joke. I made the chart up. as much as i hate to say it,i really hated brutal legend. i love tim schafer and im a big fan of metal music and action/adventure genre,so this game was like a gift from god!but after beating it i felt cheated,none of the mechanics were implemented that well and the game just did not work. Haha, today my Neuroscience Professor auctioned off a $20 bill in class just now. Thanks for the heads up. Ha, cool. What happened with the auction? I think a major part of the reason why we classify games by mechanics rather than thematics is the serious skill investment required to become competent and enjoy a different mechanical genre. Being skilled at an FPS doesn’t give you any skill with an RTS. Functionally, to move between genres, you have to learn how to read again. Fallout 3, Command & Conquer 3, Stalker: Shadow of Chernobyl and Fallen Earth are all post-apocalyptic games, but there’s practically no skill overlap. They all play very differently. Someone would *really* have to be into life after the bomb to invest the time needed to become competent in all those mechanical genres if they weren’t already. For books/film, there’s some degree of this where creators of certain genre fiction assume the reader/viewer will understand that genre’s tropes. But given there’s no way to fail watching a movie or reading a book, not being fully literate can still be somewhat enjoyable. Playing Starcraft if you’ve never played an RTS before? Likely far less enjoyable. I don’t think genres merely act as a filter for decision making. That’s definitely a big part of what it is, but there’s another angle that people like doing what they’re already good at, with just a little bit of new stuff to mix it up. The flow theory concepts of challenge and the flow experience by exercising mastery of a task does point in that direction. Maybe it’s like why sequels sell better? People just want more of what they already like, not something new. Sorry, I meant to add that maybe Brutal Legend didn’t do so well because only a limited subset of players (both action gamers and strategy gamers, sounds like a rare breed to me) would flow well with the combined action-strategy gameplay. I think it’s a mistake to downplay the tendency to group by thematic elements relative to mechanical elements. Especially when you tend to find the opposite in, for example, music and movies. For example, you’ll see ready distinctions between western RPGs and Japanese RPGs, even though artistic style is the predominant difference. Certainly part of this has to do not with the grouping of -games- as much as it has to do with our grouping of -ourselves-. Grouping of games, beers, or what have you, is little more than a tool of our self concept. We tend to typecast ourselves pretty readily. I don’t like country or rap… except for some country and rap. To elaborate a bit, games tend to break down to either reflexive games, strategic games, or a hybrid of the two (very few are purely reflexive). This is because a secondary* function of games is to develop competence, and most competencies are either mental or physical, though social competence could be argued distinctively (*it’s not technically accurate to call it a secondary function, because it’s part of the reason games are fun in the first place). So are all games that focus heavily on reflexes attractive to the same people? Certainly not. Sports, FPS, and fighting games are distinctly different genres, often based not on highly varied mechanical elements, but on the thematic iterations of these genres. No mass effect is a first person shooter WRAPPED in a “RPG story” with extremely small RPG’ish upgrade options, it is basically gears of war in the mass effect universe. You know when every fight is going to happen because of there is always the “cover” room. Mass effect 1 had RPG elements mixed with shooter, mass effect 2 is basically a straight shooter with bioware’s dialogue engine and a story. Genre’s matter because the mechanics of a game define whether you will enjoy it the USER INTERFACE aspect of it or not. I hate MMO’s for instance, I can’t stand automatic gameplay, I have to be in control of my avatar, call me a button masher if you wish. But I’ll take games like diablo and champions of norath over World of warcraft, I hate menu button skill activation in RPG’s, those were added to expand hte market to gamers that sucked at games and I still think they are overall – bad game design. It’s not a mistake to classify, gamers (the good ones anyway) are good at classifying games. Actually, you’ve (inadvertently) revealed a major flaw in the genre “system” — definitions. For example, you mention that Mass Effect isn’t really an RPG. So, my counter to that is, define to me exactly what an RPG is. You have one minute, and GO. I won’t beat the dead horse here, I just wanted to submit that genre filtering only works when everyone’s using the same definitions (or at least quite similar ones). Considering that a LOT of our genres were defined in the 2D era, we’re stuck with terms (like RPG) that don’t apply anymore. So we have to settle for combinations of genres like “Space RPG” or “FPS Adventure” or whatever. And, eventually, the genres no longer work and must be discarded, and we start over. Personally I can’t wait for “4D Turn-Based Dance-Shooter”. That’s a game I would buy. The whole problem of figuring out what genre a game belongs to mirrors similar problems in social sciences with placing things into categories. The somewhat embarrassing little secret is that researchers often just punt and let “experts” decide for them. Take a process called “The Q Sort” for example. Basically, experts on whatever it is that you’re dealing with take a bunch of things and place them into piles based on similarity. Then they discuss and refine those piles until you have your categories. Genres are a socially constructed phenomenon, anyway. The classification scheme just needs to work for whatever your goals are for it. What you define as a “good gamer”? Also, what genre of game is the best genre for “good gamers”? Everything you said aside, both Mass Effect games are third person shooters. And getting back to your other points (even though I’m sure you wont be back to read this), RPG stands for Role Playing Game; in Mass Effect you play the “role” of Commander Shepard. In a “normal” shooter you are a member of Group X (be they terrorists, counter-terrorists, Russians, Americans, Germans, etc. ), you have no real identity. To me, having an identity and being able to upgrade skills and whatnot is indicative of a game with RPG elements (at the very least). But as has been repeatedly mentioned, all our genre definitions are subjective. RPG as “you play a role” is kind of a tired saw. Yes the name of the genre is goofy, but no one thinks acting in a school play is an “RPG”, not even if it involves improv. You just kinda of have to accept that RPG represents a little blob of game design elements with fuzzy overlap, because that’s how it’s used. Common themes include: class selections, or definitions by skill point allocation; levelling up, or improvement of game-run character skills by repeated success actions; conversation with various in-game computer-run characters that provide access to game advancement and/or quest acquisition; typically a strong element of exploration vs a game on rails or with levels that are played through. To deny that “RPG” means something like that just means you’re off with your own definition of the term, and can’t use it to meaningfully communicate with other people discussing videogames. Of course, as you point out, the expansion of the acronym could mean other things, but that’s true in a lot of acronyms: CRM, DOA, or my favourite example: IDM, which stands for “intelligent dance music”, whatever that means. But people who know the music genre all know what IDM is and what it is not, it’s minimal bleepbloop frequently with arrhythmic percussion, or at least a lack of a driving beat. Typically it’s recognizable specifically as *not* being like dance music, ironically. Sorry if I was not clear, I meant that in a shooter, one does not take up a “role” per se. Further, I explicitly mention that an RPG entails leveling up, increasing skills, and overall character development. I was trying to contrast that to the shooter genre where you are an indistinct member of a group with very limited or no chances to upgrade the character. “Might as well ask “Why do we love words?”, lol. I am really having trouble grasping why someone would post a link to another thread by someone else criticising this article, and say nothing themselves. Raising awareness? Do you agree with their ‘analysis’? Is this just some spam bot linking pages across the great inter-tubes? It’s pretty hard to tell. I ask because, well, it saddens me when someone would rather regurgitate another’s opinion than form their own. This ignores that a quick read of that person’s approach to life on the internet is egotistical & unpleasant, missing fundamental truths about humanity, and where the bestowment of some minor petty anonymous power shows their true face – I don’t see Jamie calling people’s posts retarded, uneducated, or threatening to ban people just because they disagree. That and failure is spelt with an f.
In an attempt therefore to provide a better choice of rolemodel, I give you someone who actually has worked in the games industry and knows it’s more than just ‘words’: http://www.escapistmagazine.com/articles/view/columns/the-game-stash/7777-The-Game-Stash-A-Question-of-Genre. In psychology there is a term called generalizing or generalization, which basically means two (or more) things are labeled the same simply because the two share a similar characteristic. I believe that it can also apply to genres, since some people create a certain expectancy from a game they have never played to another game they have played, because both have a similarity. This in turn enforces a disposition for liking certain games (even though we have not played them before) for their genres. But of coarse, this causes one to ignore other things they would like in a game (such as story) because they simply do not know that it’s there. However, as stated in the article, it is human nature to categorize since it is quicker and easier.